Jockey Frankie Dettori will miss the 2017 Royal Ascot meeting after a fall at Great Yarmouth last week. The Italian, 46, had been due for some fancied rides, including favourite Lady Aurelia in the King's Stand Stakes on the opening day on Tuesday. 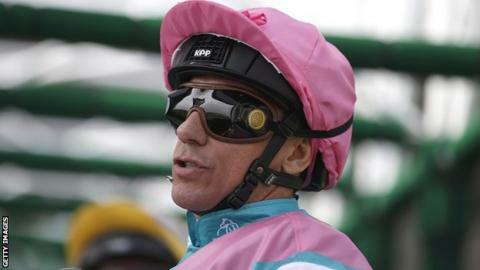 Dettori, the most successful Royal Ascot jockey currently riding, returned to action at Chantilly on Sunday. However, he is struggling with a shoulder injury and was ruled out of the five-day fixture. As well as the four rides he had booked on opening day, Dettori also had the likes of leading Prince of Wales' Stakes contender Ulysses and Commonwealth Cup hope Bound For Nowhere to partner later in the week. John Velazquez will replace Dettori on Lady Aurelia, the filly trained in the United States by Wesley Ward. This is a blow to Dettori and his supporters obviously - but perhaps just as much to the famous fixture itself. Since the first of his Royal Ascot successes way back in 1990, the now veteran rider has become one of the most significant and colourful characters here. That 'selling point' is especially important at a time when the sport is perhaps a little short on such players. In particular, American trainer Wesley Ward, who has long expressed his deep admiration for Dettori, will need to find new riders for the string of fancied horses he has brought over.